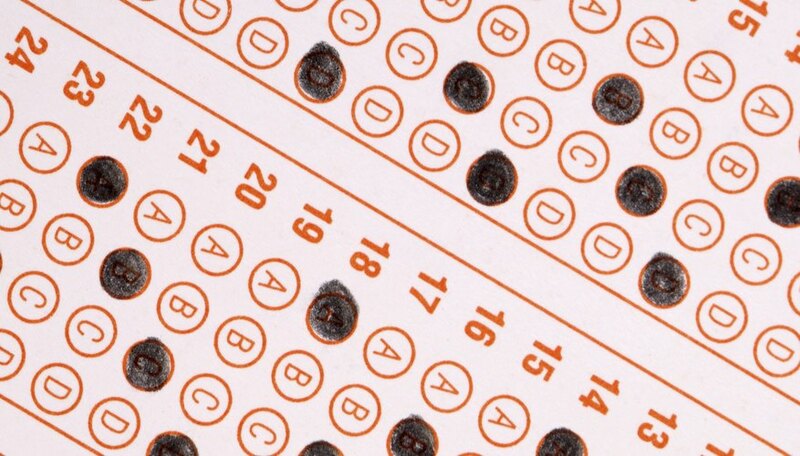 The General Educational Development, or GED, certification test has a 90-minute long math section composed of 100 questions -- 80 multiple choice, and 20 constructed answer questions where you will need to label points on a grid or write answers in a blank space on the test. To get the highest score possible on the GED, review the types of material covered by the test, and understand the test's scoring format. The math section of the GED is split into two 45-minute sections. The first half allows a calculator, while the second tests your ability to do arithmetic. You will be provided with a list of common formulas, such as the Pythagorean Theorem and the area of a circle. Review these formulas to understand what they mean, but don't worry about memorizing them. You are not penalized for incorrect answers, so while you should skip questions you do not know to save time, you should always enter a guess if you have extra time. The GED math section does not expect you to do complex arithmetic for all its questions in your head. The GED will provide a calculator for part I of the math test. Depending where you take the test, you will either be provided with a handheld FX260 calculator or an onscreen T1-30XS. Because of this, you should familiarize yourself with the calculator before the test. Learn how to do basic functions such as square roots and exponents on the calculator. The GED provides instructional videos for the two models of calculator that are allowed on the test. In each part of the math test, 40 questions will be multiple choice, and 10 will be grid questions. In a grid question, you will be provided either with a list of bubbled numbers or a bubbled graph. For a list question, you will be asked to use the list to bubble in the numeric answer to a question and write it in the boxes above the list. If the answer is a repeating decimal, such as 1.33333..., either convert it to a fraction such as 1 1/3, or round it off: 1.33. A graph question will ask you to bubble in coordinates on a graph, so review how a graph is organized -- the x-axis is the graph's horizontal axis, and the y-axis is its vertical axis. The GED tests four areas of math -- number operations, algebra, geometry, and statistics. Each section comprises between 20 and 30 percent of the test's questions, so you will have to know all four sections. Number operations test your basic arithmetical skills. Review division, multiplication, square roots, and exponents to prepare for these questions. Algebra will test your understanding of functions and patterns. Review how to show a function on a graph, and solve for variables in algebraic equations. Geometry tests your knowledge of figures and shapes. Review the formulas for area and volume of shapes, as well as the axioms and postulates governing lines and angles. You will also be tested on statistics and statistical analysis in the math section of the GED. Statistics questions may ask you to answer questions using information displayed in a graph, so review graphical representations of statistics. In addition, you should review how sampling operates in statistics and its relationship to a statistic's accuracy. Statistics questions will also include questions on probability, so review how to [calculate probability](https://sciencing.com/calculate-probability-5968362.html) -- for instance, how likely you are to draw a certain card from a deck. Zamboni, Jon. "How to Pass the GED Math Test." Sciencing, https://sciencing.com/pass-ged-math-test-2054612.html. 24 April 2017.